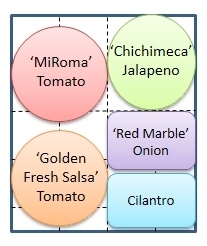 Posted on February 20, 2014, in Garden Planning and tagged Garden plan, garden planning, herbs, onions, peppers, salsa, Tomatoes. Bookmark the permalink. 2 Comments. I was just going to ask if the plants could all be harvested together. We planted a salsa garden one summer and the cilantro was gorgeous for about a week. The tomatoes weren’t successful that year (I think it was too hot… or too buggy… or something! ), but nothing could hurt the jalapenos! They thrived. Yeah, the cilantro is almost never really nice at the same time as the tomatoes. The onions will also be harvested at a different time. Nothing is as easy as you think it should be!